I’m talking about the proper use of an altar time – or prayer time in your children’s ministry service. You say – “an altar time in a children’s ministry?” Yes, unless room for response is made, many times people will only go to an altar a few times in their life; once when, or if they get married… and/or when they get saved. And of course there is that possibility, if they come when they have no where else to turn. I believe an altar time plays a vital role in the maturing of the child’s walk with God as well as the intensity of the service. I will get into the how’s, what’s, why’s and so-forth in the upcoming posts. I promise; I won’t become super-spiritual on this, nor will I be lazy in my definition and practics during these posts… I do welcome your responses. 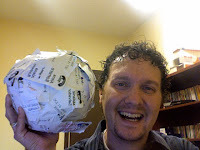 would you pay .50 to see the largest name tag ball? Well, would you? I thin k I would. 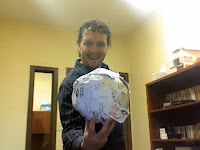 I have a name tag ball that’s pretty big – it’s actually as big as my head (no jokes please!). I was at, we got a name tag ball going that got as big as a basketball before we left. y not obeying the rule – but, it will not be sticky enough to add to the name tag ball. Do you use labels as name tags (printed or handwritten)? give it a try! the difference between a noun and a verb – particularly in reference to God’s Word. I believe that most of God’s Word written to us was written as a verb. Even where a noun exists, you must take and use your freedom as a minister to interpret it as a “noun that is in action”. Faith is a noun – However, it is a noun that is activated into a verb when we start to step out into it. Ministry is a noun – interestingly, it is something that we do or that God does through us… it’s also something that happens. What other nouns can you identify in God’s word that are things we do, God does, or are activated by our actions or God’s move? I say some of the things that I say in Children’s Ministry Presentations and Kid-Show Performances… because it’s funny! You should always have something fun, funny, witty, or just plain silly to say to your audience. Whether it’s planned or ready to cover a mistake; a funny quote, pun, gag or joke should always be in your pocket. 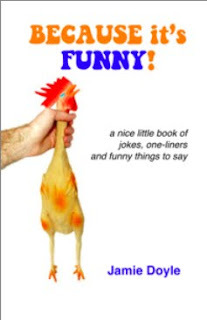 My latest book, “Because it’s Funny” is 40 Pages of funny things to say that have worked for me over the years – maybe some of these things will work for you too. This is my first book-endeavor that is not exclusively a Children’s Ministry resource… although the stuff in it has been developed both in Children’s Ministry Presentations like: children’s churches, kids’ crusades, camps and outreaches… as well as Kid-Show and Family Performances like; school assemblies, daycares and birthday parties. Besides, at the last FCM conference I was at, Del WIlson said that he really liked the cover – thanks Del! Please go to the online bookstore and get it immediately as a download! …and while you’re there pick up a few other downloads why don’t ya! It’s my favorite way to point kids the real answer to eternal life. It’s essentially a big flash-card-type of an effect. You show what appears to be 5 cards; each with a picture depicting a way that some think will lead them to heaven. A spectator is asked to take the cards and begin eliminating all of the cards except for one. When that card is revealed, it shows a picture that represents Jesus… a card that was apparently not in the pack of cards to begin with! The download gets you the instructions and graphics to make the flash-cards. I’m sure you’ll find it to be an effective way to communicate the Good News of Jesus Christ in your class, children’s church or at an outreach. It’s only $8… and it’s in my online bookstore – click here!